Monte Cook has done very little in his life that didn't have anything to do with roleplaying games. He began gaming in 1978, and started working professionally in the game industry in 1988. In the employ of Iron Crown Enterprises, he worked with the Rolemaster and Champions games as an editor, developer, and designer. In 1994 Monte came to work at TSR as a game designer. Now a senior game designer with Wizards of the Coast's RPG R&D, he writes products for most of the game lines, although he's done quite a lot in the Planescape setting. Monte is one of the designers for the Third Edition of Dungeons & Dragons, working on the project from the beginning. He attempts to address the concerns of those who have left AD&D to play other games, as well as those of the long-term player. 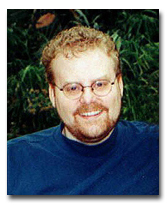 Aside from the core conceptions of the changes to the game, Monte contributed most heavily to the new Dungeon Master's Guide, serving as the primary writer for that product. In his spare time, he runs anywhere from one to three games per week, holds a yearly game convention at his house, builds vast dioramas out of LEGO building bricks, and reads a lot of comics. A graduate of the Clarion West writer's workshop, Monte has also published short stores and a novel, The Glass Prison. He lives with his wife Sue (managing producer of Wizards Online Media) and his rabbit Wilbur (who doesn't work for Wizards -- yet! ).